This portion of the transcription series deals with transcription factors and the effects of their binding on metabolism. This also has implications for pharmaceutical target identification. 1 Department of Human Genetics, 2 Howard Hughes Medical Institute, University of Chicago, Chicago, IL 3 Departments of Genetics and Biology and Howard Hughes Medical Institute, Stanford University, Stanford, CA. the regulatory logic underlying functional transcription factor binding is poorly understood. it is generally accepted that much of the binding does not strongly influence gene expression. examined which genes were impacted by the reduced transcription factor level. a simple model of functional vs. non-functional binding may not suffice. functional consequences with respect to gene expression output. to evaluate the context of functional TF binding. within 10 kb of the transcription start sites of expressed genes. This combination of data allowed us to infer functional TF binding. depending on cell-type and other factors. Genomic studies addressing questions of the regulatory logic of the human genome have largely taken one of two approaches. led to many insights into the principles and mechanisms of gene regulation. downstream effect on gene regulation. the expression level of a specific target gene by using small interfering RNAs (siRNAs). after specifically attenuating the expression level of a given factor. the regulatory relationship of a single factor with its downstream targets. used a subset of these to validate certain regulatory predictions based on binding motif enrichments. binding map strategies and QTL mapping strategies. to refine our understanding of the gene regulatory circuitry of the human genome. is most likely to be associated with variation in the expression level of a nearby gene. expression data collected from six samples that were transfected with negative control siRNA. quantile normalization followed by batch correction using the RUV-2 method. we used likelihood-ratio tests within the framework of a fixed effect linear model. the three knockdown replicates of each factor and the six controls. (Figure 1B; see Table S3 for a summary of the results). from 50% to 90% (based on qPCR; Table S1). based on the microarray data (P =0.001; Figure 1C). the number of genes classified as differentially expressed foci. beyond merely the number of affected target genes. consistent in magnitude across all knockdowns. while the median effect size for any individual knockdown experiment ranged between 8.1% and 11.0%. (this was true whether we estimated the knockdown effect based on qPCR (P = 0.10; Figure 1D) or microarray (P = 0.99; not shown) data. 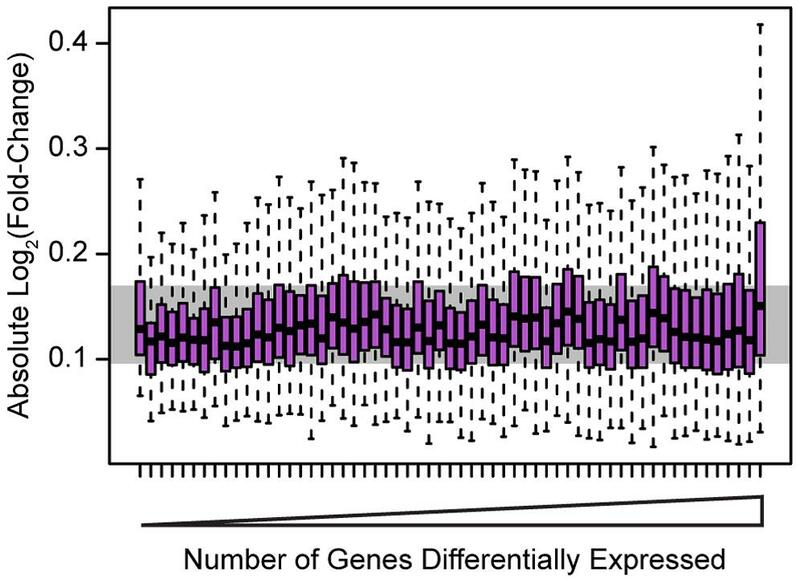 the number of genes differentially expressed (P = 0.94; Figure 1E). extended even to knockdowns of factors from the same gene family. Figure 1. Differential expression analysis. (a) Examples of differential expression analysis results for the genes HCST and IRF4. The top two panels are ‘MA plots’ of the mean Log2(expression level) between the knockdown arrays and the controls for each gene (x-axis) to the Log2(Fold-Change) between the knockdowns and controls (y-axis). Differentially expressed genes at an FDR of 5% are plotted in yellow (points 50% larger). The gene targeted by the siRNA is highlighted in red. The bottom two panels are ‘volcano plots’ of the Log2(Fold-Change) between the knockdowns and controls (x-axis) to the P-value for differential expression (y-axis). The dashed line marks the 5% FDR threshold. Differentially expressed genes at an FDR of 5% are plotted in yellow (points 50% larger). The red dot marks the gene targeted by the siRNA. (b) Barplot of number of differentially expressed genes in each knockdown experiment. (c) Comparison of the knockdown level measured by qPCR (RNA sample collected 48 hours posttransfection) and the knockdown level measured by microarray. (d) Comparison of the level of knockdown of the transcription factor at 48 hrs (evaluated by qPCR; x-axis) and the number of genes differentially expressed in the knockdown experiment (y-axis). (e) Comparison of the variance in knockdown efficiency between replicates for each transcription factor (evaluated by qPCR; x-axis) and the number of differentially expressed genes in the knockdown experiment (y-axis). Figure 2. Effect sizes for differentially expressed genes. Boxplots of absolute Log2(fold-change) between knockdown arrays and control arrays for all genes identified as differentially expressed in each experiment. Outliers are not plotted. The gray bar indicates the interquartile range across all genes differentially expressed in all knockdowns. Boxplots are ordered by the number of genes differentially expressed in each experiment. Outliers were not plotted. significantly enriched for cholesterol and sterol biosynthesis annotations. primarily affected pathways consistent with their known biology. binding maps together with the knockdown expression data. and from ChIP-seq experiments in LCL GM12878, published by ENCODE. differentially expressed in one of the knockdown experiments. binding of that factor was inferred within 10kb of the transcription start site (TSS) of the target gene. in proximity to a median of 1,922 genes per factor (range 11 to 7,053 target genes). was differentially expressed after perturbing the expression level the bound transcription factor. the transcription factor binding data and the knockdown expression data. differentially expressed following the knockdown of the factor. we examined sequence features that might distinguish functional binding. whether binding sites that better matched the known PWM for the factor were more likely to be functional. that were significantly better matches to the canonical binding motif. Figure 3. Intersecting binding data and expression data for each knockdown. 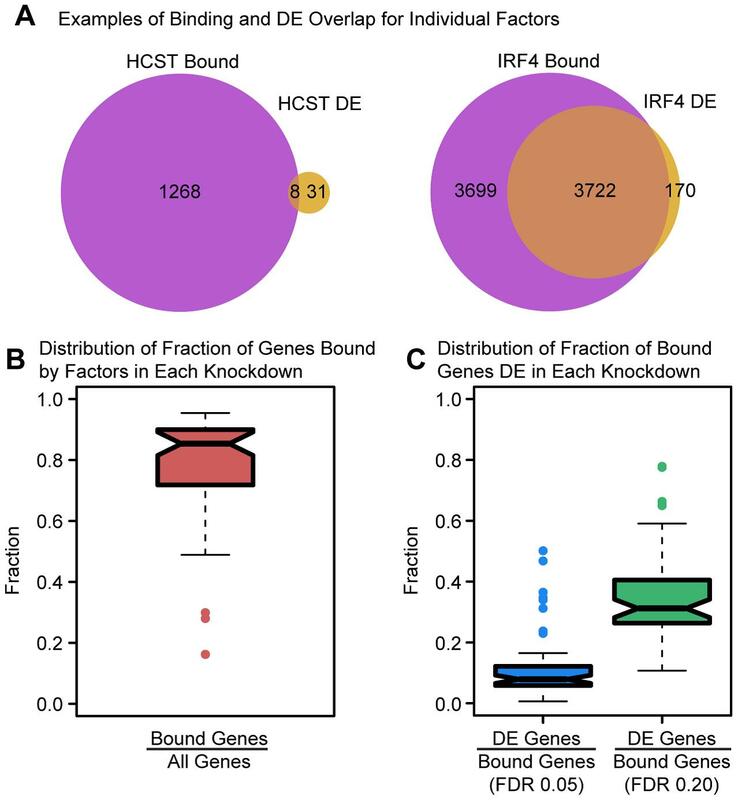 (a) Example Venn diagrams showing the overlap of binding and differential expression for the knockdowns of HCST and IRF4 (the same genes as in Figure 1). (b) Boxplot summarizing the distribution of the fraction of all expressed genes that are bound by the targeted gene or downstream factors. (c) Boxplot summarizing the distribution of the fraction of bound genes that are classified as differentially expressed, using an FDR of either 5% or 20%. (considering the siRNA-targeted factor and any TFs that were DE in the knockdown; P,10216; Figure 4B). (b) the number of differentially expressed transcription factors binding events near functionally or non-functionally bound genes. We considered binding for siRNA-targeted factor and any factor differentially expressed in the knockdown. 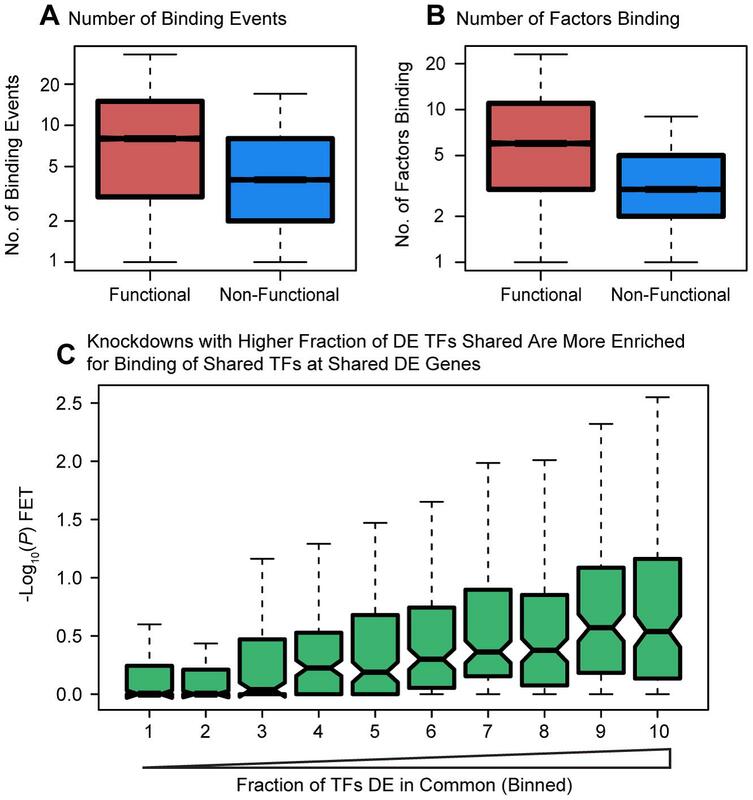 (c) Focusing only on genes differentially expressed in common between each pairwise set of knockdowns we tested for enrichments of functional binding (y-axis). 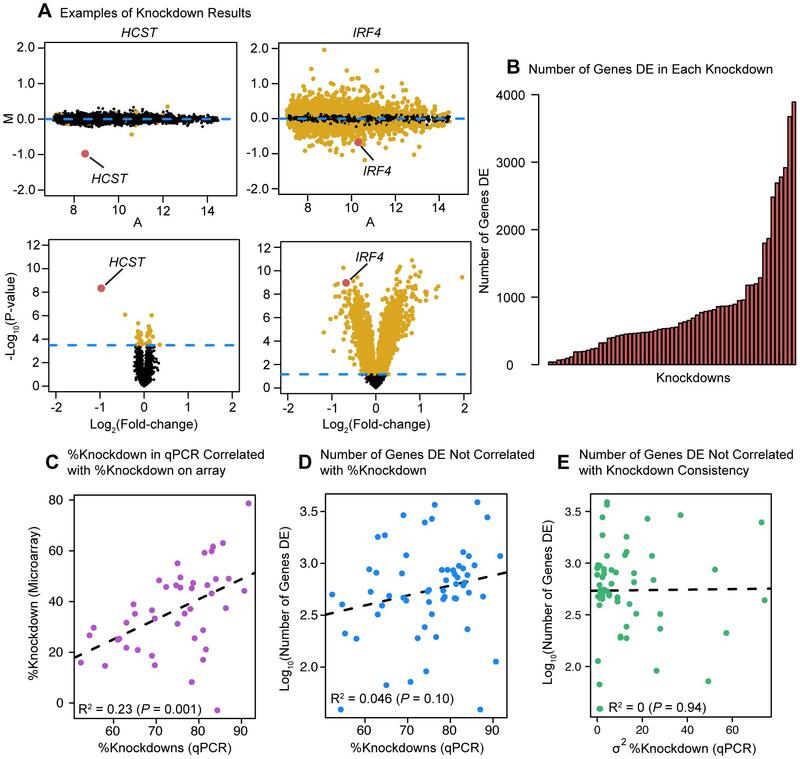 Pairwise comparisons between knockdown experiments were binned by the fraction of differentially expressed transcription factors in common between the two experiments. For these boxplots, outliers were not plotted. near the TSS whether or not the genes were classified as differentially expressed (Figure 5A). the distance from the TSS to the binding sites was significantly longer for differentially expressed genes (P,10216; Fig. 5B). Figure 5. Distribution of functional binding about the TSS. (a) A density plot of the distribution of bound sites within 10 kb of the TSS for both functional and non-functional genes. Inset is a zoom-in of the region +/21 kb from the TSS (b) Boxplots comparing the distances from the TSS to the binding sites for functionally bound genes and non-functionally bound genes. For the boxplots, 0.001 was added before log10 transforming the distances and outliers were not plotted. based on ChIP-seq data for various histone modifications and CTCF binding. tested whether binding in that state was enriched around differentially expressed genes. After correcting for multiple testing of genes that were differentially expressed. on the expression levels of genes they purportedly regulated? All factors we tested are associated with both up- and down-regulation of downstream targets (Figure 6). following the knockdown for 15 of the 29 factors for which we had binding information (Figure 6B). the enzymatic component of the Polycomb group complex. 66.7% of differentially expressed targets were down-regulated following the knockdown. Figure 6. Magnitude and direction of differential expression after knockdown. (a) Density plot of all Log2(fold-changes) between the knockdown arrays and controls for genes that are differentially expressed at 5% FDR in one of the knockdown experiments as well as bound by the targeted transcription factor. (b) Plot of the fraction of differentially expressed putative direct targets that were up-regulated in each of the knockdown experiments. the fraction of bound genes that were differentially expressed following the knockdown (Figure S8). do not fully explain the regulatory effects of the knockdown experiments. much beyond what is expected by chance alone, but far from accounting for all functional binding. the direction of effect that perturbing a transcription factor had on the expression level of its direct targets. which can be used to infer that the factor represses or activates the target, respectively. many of the factors function as repressors at least as often as they function as activators. and with – the biochemical characterization of the AP-1 complex (of which JUND is a component) as a transactivator. many transcription factors should primarily act as activators with the results presented here. releases the regulatory region to binding by an alternative, stronger activator. using an independent, empirically determined set of target genes. independently of proximity to a particular promoter. assigned binding events to genes based on the classification of Thurman et al. consistent with our proximity-based observations. (compared to 11.1% when the assignment of binding sites to genes is based on proximity). (compared to 32.3% for the proximity based definition). The results of this analysis are summarized in Table S7. to learn some of the principles of functional transcription factor binding. a more conservative estimate of the fraction of binding that is indeed functional would not consider data within the promoter. does not change our conclusions. also differentially expressed after the knockdowns. we are only considering binding in a limited window around the transcription start site. To address these issues, more factors should be perturbed to further evaluate the robustness of our results and to add insight. Together, such studies will help us develop a more sophisticated understanding of functional transcription factor binding in particular, the gene regulatory logic more generally. Recently the biological pathways have become a common and probably the most popular form of representing biochemical information for hypothesis generation and validation. These maps store wide knowledge of complex molecular interactions and regulations occurring in the living organism in a simple and obvious way, often using intuitive graphical notation. Two major types of biological pathways could be distinguished. the content of signal transduction and transcriptional regulatory pathways varies greatly in quality and completeness. less than thirty putative transcriptional targets of MYC are even close to complete. to derive direct targets of transcription factors. are compared with relevant lists of transcriptional targets from 10 commonly used pathway databases. surprisingly small and often is not statistically significant. yields statistically significant intersection with experimental results in 84% cases. suggest novel putative therapeutic targets in cancer. solid scientific evidence and rigorous empirical evaluation. the interactions of the type ‘transcription factor-transcriptional targets’. MYC, NOTCH1, BCL6, TP53, AR, STAT1, and RELA. The choice of transcription factors is based on their important role in oncogenesis and availability of binding and expression data in the public domain. (2) the lists of experimentally derived direct targets are used to assess the quality and completeness of 84 transcriptional regulatory pathways from four publicly available (BioCarta, KEGG, WikiPathways and Cell Signaling Technology) and six commercial (MetaCore, Ingenuity Pathway Analysis, BKL TRANSPATH, BKL TRANSFAC, Pathway Studio and GeneSpring Pathways) pathway databases. can be used to reveal new biological insight on transcriptional regulation. that act in interconnected molecular pathways. Detection of such genes is important as it could reveal novel targets of cancer therapy. 20,000 genes two sets with 300 and 700 genes each, their overlap would be greater or equal to 16 genes in 6.34% times. Thus, this overlap will not be statistically significant at 5% a-level (p = 0.0634). On the other hand, consider that for the pathway database #2, there are 30 direct targets of that transcription factor, and their intersection with the 700-gene gold-standard is only 6 genes. 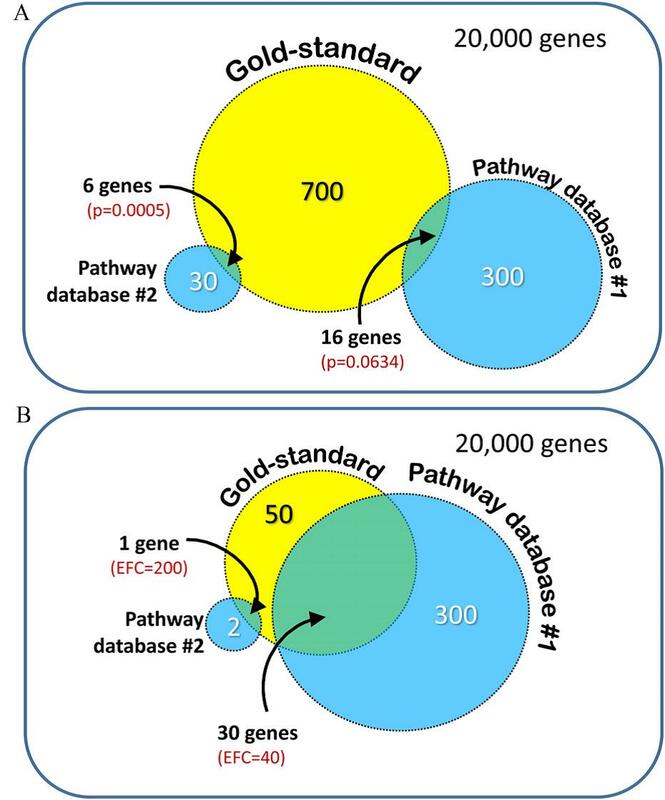 Even though the size of this intersection is rather small, it is unlikely to randomly select 30 genes (out of 20,000) with an overlap greater or equal to 6 genes with a 700-gene gold-standard (p = 0.0005, see Figure 2a). This overlap is statistically significant at 5% a-level. targets of that transcription factor, and their intersection with the 50-gene gold-standard is only 1 gene. Even though the expected overlap under the null hypothesis will be equal to 0.005 and EFC equal to 200 (5 times bigger than for the database #1), the size of this intersection with the gold-standard is 30 times less than for database #1 (Figure 2b). with functional gene expression microarray and RNA-seq data. after the inhibition or over-expression of the transcription factor in question. obtain an accurate list of gene targets that are directly regulated by a transcription factor. transcriptional regulation in a cell is dynamic and works differently for different systems and stimuli. importance of deriving a specific list of transcriptional targets for the current experimental system. In this study we followed the latter approach by developing gold-standards for specific cell characterized biological systems and experimental conditions. NOTCH1, MYC and RELA targets. essential for the prediction of genes that could be targeted in cancer treatments. In agreement with this hypothesis, several of the genes identified in our analysis have been suggested to be putative therapeutic targets in leukemia, with either preclinical or clinical trials underway (CDK4, CDK6, GSK3b, MYC, LCK, NFkB2, BCL2L1, NOTCH1). I Izeddin†, V Récamier†‡, L Bosanac, II Cissé, L Boudarene, et al. de l’Ecole Normale Supérieure (IBENS), Paris, Fr; 3Transcription Imaging Consortium, Janelia Farm Research Campus, Howard Hughes Medical Institute, Ashburn, US; + more. they do this by binding to other proteins or DNA. finding their targets in the nucleus, which is crowded with other proteins and DNA. Much research to date has focused on measuring how fast proteins can diffuse and spread out throughout the nucleus. However these measurements only make sense if these proteins have access to the same space within the nucleus. single protein molecules in the nucleus of mammalian cells. they ‘explored’ the space inside the nucleus in very different ways. of reaching any target regardless of its position in this space. the nucleus in a ‘compact’ way. through the nucleus and is therefore guided to its potential targets. how far they can travel in a given time. can control the expression of genes. the potential ways that this strategy might be regulated. Mueller et al., 2010; Normanno et al., 2012). These transient interactions are essential to ensure a fine regulation of binding site occupancy—by competition or by altering the TF concentration—but must also be persistent enough to enable the assembly of multicomponent complexes (Dundr, 2002; Darzacq and Singer, 2008; Gorski et al., 2008; Cisse et al., 2013). How crowding influences transport properties of macromolecules and organelles in the cell is a fundamental question in quantitative molecular biology. While a restriction of the available space for diffusion can slow down transport processes, it can also channel molecules towards their targets increasing their chance to meet interacting partners. A widespread observation in quantitative cell biology is that the diffusion of molecules is anomalous, often attributed to crowding in the nucleoplasm, cytoplasm, or in the membranes of the cell (Höfling and Franosch, 2013). An open debate remains on how to determine whether diffusion is anomalous or normal (Malchus and Weiss, 2009; Saxton, 2012), and the mechanisms behind anomalous diffusion (Saxton, 2007). The answer to these questions bears important consequences for the understanding of the biochemical reactions of the cell. exploration of the space. In chemistry, the influence of compactness is well established to describe dimensional effects on reaction rates (Kopelman, 1986). In this study, we aim to elucidate the existence of different types of mobility of TFs in the eukaryotic nucleus, as well as the principles governing nuclear exploration of factors relevant to transcriptional control. To this end, we used single-molecule (SM) imaging to address the relationship between the nuclear geometry and the search dynamics of two nuclear factors having distinct functional roles: the proto-oncogene c-Myc and the positive transcription elongation factor (P-TEFb). c-Myc is a basic helix-loop-helix DNA-binding transcription factor that binds to E-Boxes; 18,000 E-boxes are found in the genome, and c-Myc affects the transcription of numerous genes (Gallant and Steiger, 2009). Recently, c-Myc has been demonstrated to be a general transcriptional activator upregulating transcription of nearly all genes (Lin et al., 2012; Nie et al., 2012). P-TEFb is an essential actor in the transcription regulation driven by RNA Polymerase II. P-TEFb is a cyclin-dependent kinase, comprising a CDK9 and a Cyclin T subunit. It phosphorylates the elongation control factors SPT5 and NELF to allow productive elongation of class II gene transcription (Wada et al., 1998). The carboxy-terminal domain (CTD) of the catalytic subunit RPB1 of polymerase II is also a major target of P-TEFb (Zhou et al., 2012). c-Myc and P-TEFb are therefore two good examples of transcriptional regulators binding to numerous sites in the nucleus; the latter binds to the transcription machinery itself and the former directly to DNA. tags (Mazza et al., 2012). An alternative approach takes advantage of photoconvertible tags (Lippincott-Schwartz and Patterson, 2009) and photoactivated localization microscopy (PALM) (Betzig et al., 2006; Hess et al., 2006). Single particle tracking PALM (sptPALM) was first used to achieve high-density diffusion maps of membrane proteins (Manley et al., 2008). However, spt-PALM experiments have typically been limited to proteins with slow mobility (Manley et al., 2008) or those that undergo restricted motions (Frost et al., 2010; English et al., 2011). Recently, by inclusion of light-sheet illumination, it has been used to determine the binding characteristics of TFs to DNA (Gebhardt et al., 2013). In this study, we developed a new sptPALM procedure adapted for the recording of individual proteins rapidly diffusing in the nucleus of mammalian cells. We used the photoconvertible fluorophore Dendra2 (Gurskaya et al., 2006) and took advantage of tilted illumination (Tokunaga et al., 2008). A careful control of the photoconversion rate minimized the background signal due to out-of-focus activated molecules, and we could thus follow the motion of individual proteins freely diffusing within the nuclear volume. With this sptPALM technique, we recorded large data sets (on the order of 104 single translocations in a single imaging session), which were essential for a proper statistical analysis of the search dynamics. We applied our technique to several nuclear proteins and found that diffusing factors do not sense a unique nucleoplasmic architecture: c-Myc and P-TEFb adopt different nuclear space-exploration strategies, which drastically change the way they reach their specific targets. The differences observed between the two factors were not due to their diffusive kinetic parameters but to the geometry of their exploration path. c-Myc and our control protein, ‘free’ Dendra2, showed free diffusion in a three-dimensional nuclear space. In contrast, P-TEFb explored the nuclear volume by sampling a space of reduced dimensionality, displaying characteristics of exploration constrained in fractal structures. The role of the space-sampling mode in the search strategy has long been discussed from a theoretical point of view (de Gennes, 1982a; Kopelman, 1986; Lindenberg et al., 1991). Our experimental results support the notion that it could indeed be a key parameter for diffusion-limited chemical reactions in the closed environment of the nucleus (Bénichou et al., 2010). We discuss the implications of our observations in terms of gene expression control, and its relation to the spatial organization of genes within the nucleus.